I don’t think the sponsors of the international Samsung Cup were very happy this year, since no South Korean player made it into the final. In fact, the final matched two Chinese players: Kong Jie 9 dan (who defeated Gui Li, also of China, in the semifinals) and Qiu Jun 8 dan of China (who eliminated Lee Changho of South Korea in the other semifinal). Kong Jie won the best-of-three match against Qiu Jun after two straight wins. Interestingly, Kong Jie also played in last year’s Samsung Cup final match, but he lost 0:2 against Lee Sedol. The game record of the 1st game is here. Kong Jie (white) won by 5.5 points. The game record of the 2nd game is here. Kong Jie (black) won by resignation. 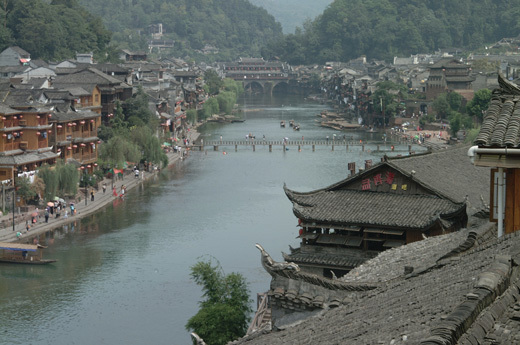 Fenghuang is an exceptionally well-preserved ancient Chinese town, according to wikipedia, with unique ethnic languages, customs, arts and architectural remains of Ming and Qing styles. 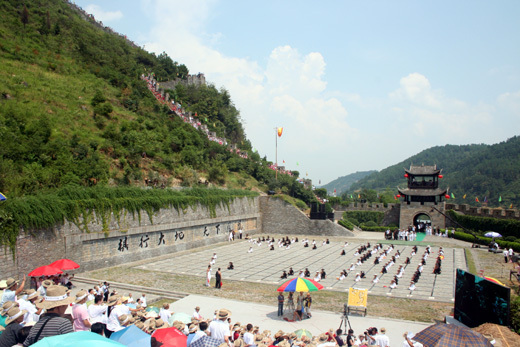 Fenghuang also has the largest Go board in the world and it hosts a match between two invited top professional players as part of a Go festival every two years. The two players are playing the game in a tower next to the board, while people costumed in black or white are moving on the huge board to mark the current position in the game. 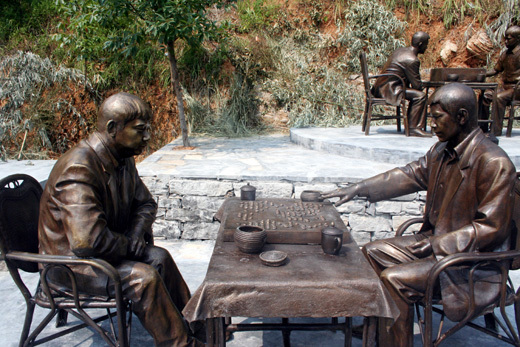 Besides the huge Go board, there are also statues of famous professional players – can you guess who is who? 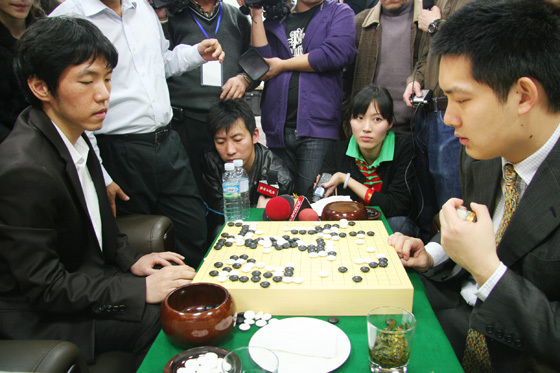 This year’s match was between Lee Sedol of Korea and Gu Li of China. The game commentary, with analysis in great detail by Lee Hajin 3p, is broadcast in English on this youtube channel. Photo sources here, here, here, here. 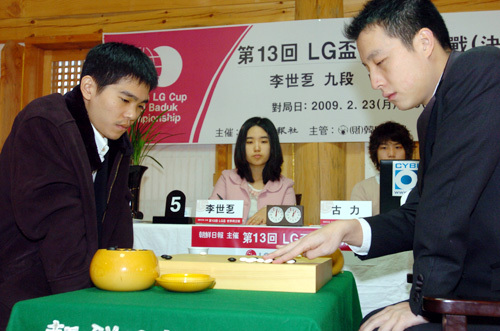 Gu Li won the second game of the LG Cup final against Lee Sedol, thus winning this top international competition. Here is the game record of this second and last game of the final. To qualify for the final, Gu Li defeated Mok Jinseok 9p of Korea, Won Sungjin 9p of China, Kim Hyeongwoo 3p of Korea and Lee Changho 9p of Korea. This must have also been “sweet revenge” for Gu Li, as he lost to Lee Sedol in Nongshim Cup last week, thus ruining China’s chances to win that competition. Also a pretty rare opportunity to see Gu Li’s smile – he’s usually looking so serious! More photos from the match here, here, here, here, here and here. Video from the match here. The LG Cup finalists this year are Lee Sedol of Korea and Gu Li of China. 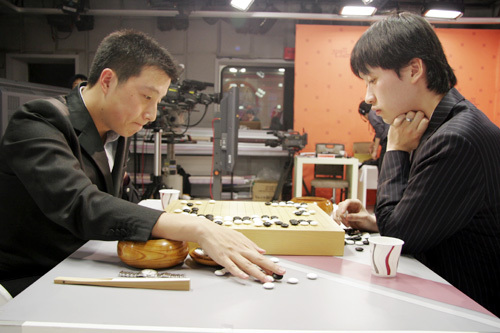 The two have played together very recently: only four days ago Lee Sedol won against Gu Li in the Nongshim Cup. The LG Cup final consists of a best-of-three match, with 3 hours thinking time. 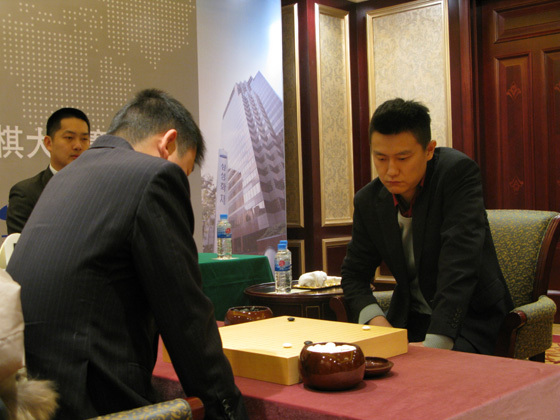 Gu Li won the first game, played today (February 23rd). Second game will be played in two days. 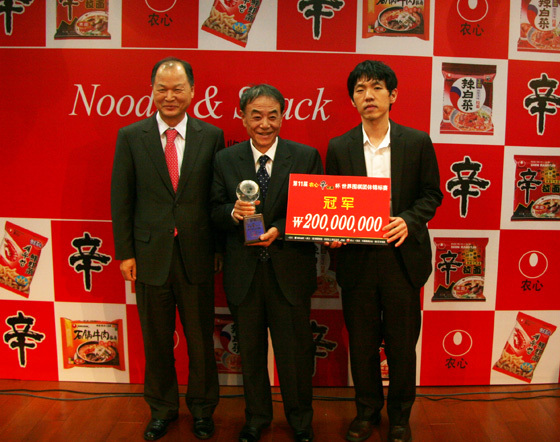 Nongshim Cup return to Korea this year, after Lee Sedol’s win against the last standing member of the Chinese team, Gu Li. 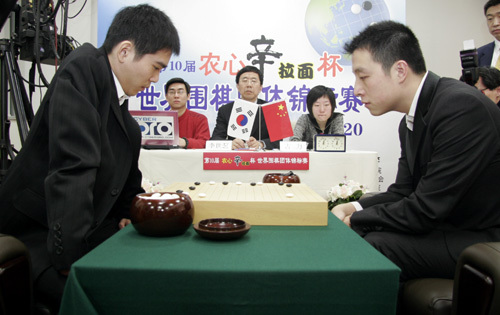 Last year it was China who won, when Chang Hao defeated Park Yeonghun of Korea. 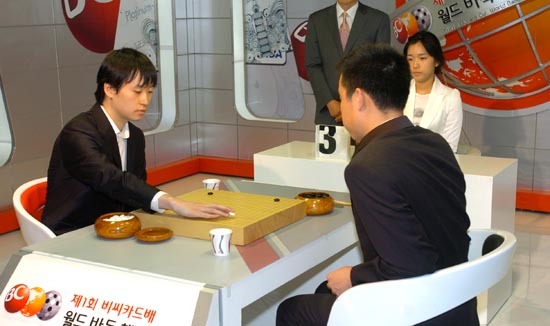 This game between Lee Sedol and Gu Li has even deeper meanings for the two of them, as they going to play each other a best-of-three match in the final of the international LG Cup in just a few days (Feb 23-26). Here is the final game. Lee Sedol, playing white, defeated Gu Li by 3.5 points.